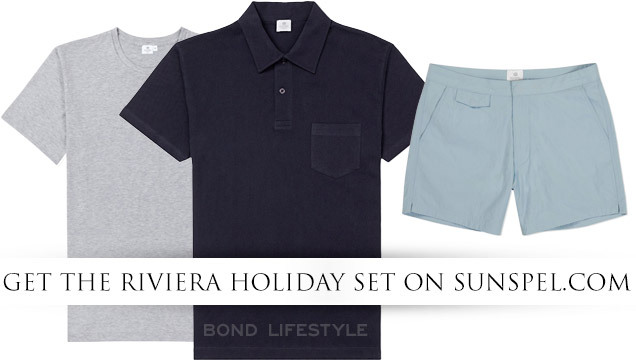 The Riviera Holiday Set from Casino Royale is available for $360 (USA) / £225 (UK) / €275 (EU) on the official Sunspel website and allows you to collect these 3 classic styles with a saving of almost 15% on their individual prices. You can select each item in any color you want. If you want the movie accurate colors, then get the polo in navy, and the crew neck t-shirt in grey melange or v-neck t-shirt in white. 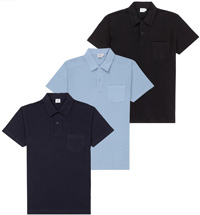 Bond wears the navy blue Sunspel Riviera Polo Shirt on the Bahamas when he meets with M. Since the release of the film, the shirt has proven to be one of the most popular Bond related clothing items and a Bond fan favourite. In the Madagaskar, Miami Airport an Venice scenes of the film, Bond wears the grey crew-neck Riviera shirt. The white v-neck shirt can be seen in Venice, worn underneath the black cardigan. Read more about the Sunspel shirts in Casino Royale. The swimming shorts, inspired by Sean Connery's shorts from his early Bond movies, were made by Sunspel and costume designer Lindy Hemming for the Designing 007 exhibition.